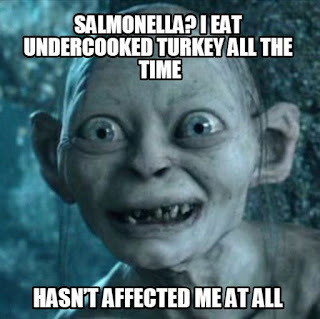 What's all the fuss about salmonella in the turkeys? Cook it to an internal temperature of 165°F and it's gone, right? That will kill the bacteria in the finished bird, but that's only one issue. The real issues are in the preparation. Dealing with a large raw turkey opens up many opportunities for cross contamination. For example in the sink, where the turkey may have been held and then later where the ingredients for a ready-to-eat salad will be washed. Or on counters where the turkey has been prepped, with foods, cans, seasons, and utensils. And the most dangerous likehood of cross-contamination is your hands, which are touching the food, cans, seasoning and utensils. If you have a turkey that has been recalled, keep it frozen in its original packaging, put it in another plastic bag and return it to the store. Then wash and sanitize your hands, clean and sanitize the area where the turkey was held, and wash your hands again. Also, remember that any turkey could have some salmonella bacteria, so keep everything away from the raw bird and clean and sanitize anything that it or your hands touch. Be food safety aware and have a fun, safe Thanksgiving!